Buco, Margaret M., passed Thursday, July 9, 2015 at Kent County Memorial Hospital. Born in Providence a daughter of the late Phillip and Eva Olivera DePamphilis she lived in Cranston for most of her life. Peggy was an assembler for the former North Safety Company for 17 years before retiring in 2005. She was always enjoying her family and feeding them including her famous soups. She leaves 3 daughters; Elizabeth A. 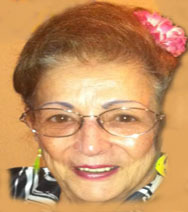 (Richard) Cinieri of Delray Beach, FL, Margaret A. (James) Poulos of Cranston and Andrea E. Casimiro of Cranston, a daughter-in-law Belinda Moretti of Cranston, 2 brothers; Anthony DePamphilis of East Providence and John DePamphilis of Cranston, a sister Ann Barrett of Huberston, MA, 10 grandchildren and 10 great grandchildren. She was the mother of the late John Moretti and wife of the late Michael Moretti and Angelo Buco.